Here are photos of some dishes you might like to try on your trip to Mexico. Click on the image to see it larger and read more information about each dish. This Mexican hot chocolate is yummy. The bread is called "pan de yema," yolk bread. The chocolate is served in a bowl to make dipping your bread in it easier. If you're lactose intolerant, you'll be happy to know you can still enjoy your hot chocolate - just ask for "chocolate de agua." This is a type of atole, a thick drink that can be made with corn, rice or oats. Champurrado is made with corn masa and chocolate. It's great for breakfast! Why don't you have a taste of Mexico at home? 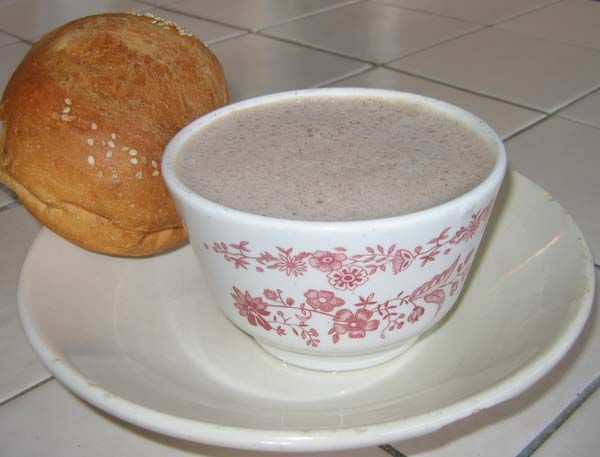 Here's a recipe for champurrado from About's Guide to Mexican Food. Huevos rancheros are a typical Mexican breakfast. These were served at 100% Natural Restaurant. Make some yourself with this Huevos Rancheros Recipe from About.com's Guide to Mexican Food..
Chilaquiles are fried tortilla strips cooked in green sauce. Here they're served with fried eggs and beans. This makes for a very filling almuerzo. I love these enchiladas. This is the way they're served in Oaxaca. These are corn tortillas which are lightly fried, then dipped in a mole sauce that is slightly spicy, and sprinkled with crumbly cheese. They're garnished with onion and parsley. Yum! This is a great, healthy way to start your day - especially when you're going to be busy sightseeing! Some travelers to Mexico prefer to avoid salads for fear of Montezuma's Revenge, but in most reputable restaurants this is not a problem as they clean the vegetables with special drops that kill the bacteria that can make you sick. Here's a photo of a breakfast I had at Potzollcalli restaurant in Mexico City. Sanborns restaurant has an extensive kids menu with lots of fun options for under twelves. This is what my daughter had for breakfast at the Sanborns in the House of Tiles in Mexico City. Tamales (singular tamal) are corn dough dumplings with a sweet or savory filling. They are wrapped in corn husk or banana leaf and steamed. Tamales are a traditional Mexican food that are often prepared for special occasions, such as Day of the Dead, Christmas, and ​Candlemas (Dia de la Candelaria). Learn how to make tamales, from About.com's Guide to Mexican Food. The Chile en Nogada is a delicious traditional Mexican dish with an interesting history. Find out more about the Chile en Nogada. Tortillas are a staple of Mexican cuisine, and accompany nearly every meal. The most delicious tortillas are made by hand and cooked on a clay griddle, called a comal. A great plus that you get when visiting Mexico's fantastic beach destinations is that you get to sample lots of wonderful fresh seafood, like these giant shrimp that were served in a restaurant in Huatulco. If you order fried fish, you can expect to be served the whole fish - head and all. Cazuelas are earthenware pots. These cazuelas have different foods in them for filling tacos. The tacos made with these fillings are called tacos de cazuela.